At Arrow & Bow, we have the client—and only the client—in mind. Your dedicated Wealth Advisor partners with you. At Arrow & Bow Wealth Advisors, we have access to independent research on the economy and the markets. The need to be objective and independent is greater than ever with increased changes in the economy and unsettling market volatility. This access allows us the freedom to offer clients strategies to manage the challenges of wealth accumulation and management. No one strategy fits everyone, which is why every client gets our undivided attention—from planning to execution to follow-up. We take a proactive approach to helping you develop a strategy to address your financial goals and objectives, using the most efficient methods available. As a group of independent advisors we have no proprietary investment offerings or products allowing us to ensure the advice you receive is objective. Your Professional Team helps guide and assist you. We commit ourselves to our clients’ financial goals as if they were our own. Our clients in return seek a committed relationship that is equally beneficial for both parties. Along with your advisor, we proactively help guide you as program facilitators, answering your questions and providing the resources you and your family require to make educated decisions that will serve your best interests and objectives. LPL Financial is one of the nation's leading financial services companies and a publicly traded company under ticker symbol LPLA. The firm's mission is rooted in the belief that objective financial guidance is a fundamental need for everyone. LPL does not offer proprietary investment products or engage in investment banking activities; this means advisors affiliated with LPL are not pressured or influenced by LPL to sell its products. 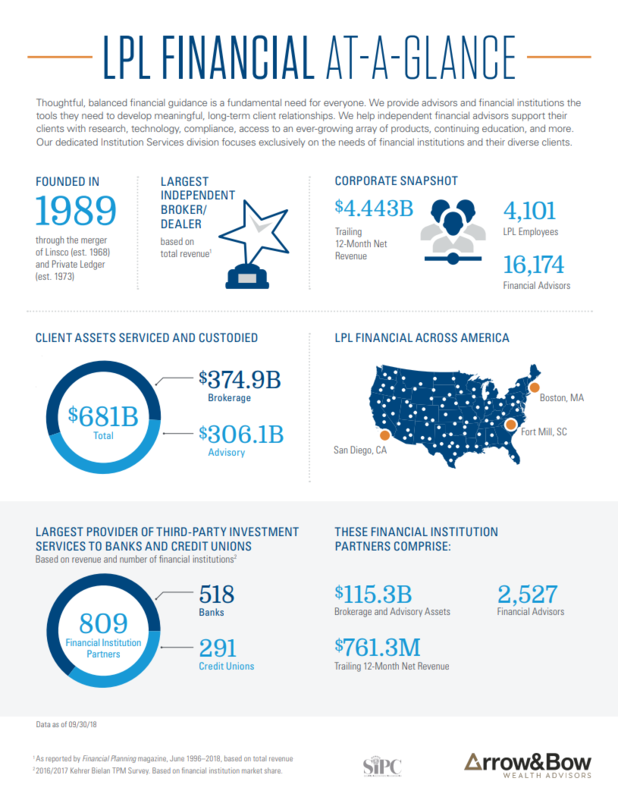 Thousands of financial advisors nationwide are able to rely on the firm's tools and resources to help them provide financial guidance and recommendations to help meet their clients' needs. Download a snapshot of LPL at a Glance.